Pottery of Canaanite (Syro-Palestinian) origin found in the royal tombs of the First and Second Dynasties (The Old Kingdom) at Abydos, Saqqara, Abusir el-Melek, and other sites in Upper Egypt, dating to Early Bronze Age II (3300-2700 BCE). The pottery, often red-rose slipped and burnished or painted with geometric motifs, includes jugs, bottles, and jars. Most common are the red-slipped jugs, some of a hard-baked "metallic" quality, with handles attached to the rim and a typical stamped base. This pottery class took its name from Abydos, the first site at which it was found, in Upper Egypt. First found in an Egyptian royal tomb in Abydos, Abydos Ware has since been found in Egyptian royal tombs elsewhere as well. Abydos Ware is of Canaanite origin and indicates extensive trade. 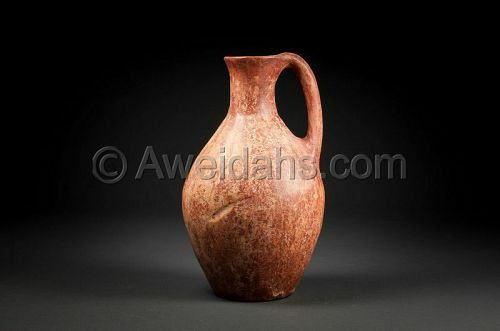 Abydos Ware was important in trading wine and oils, and includes several different groups.